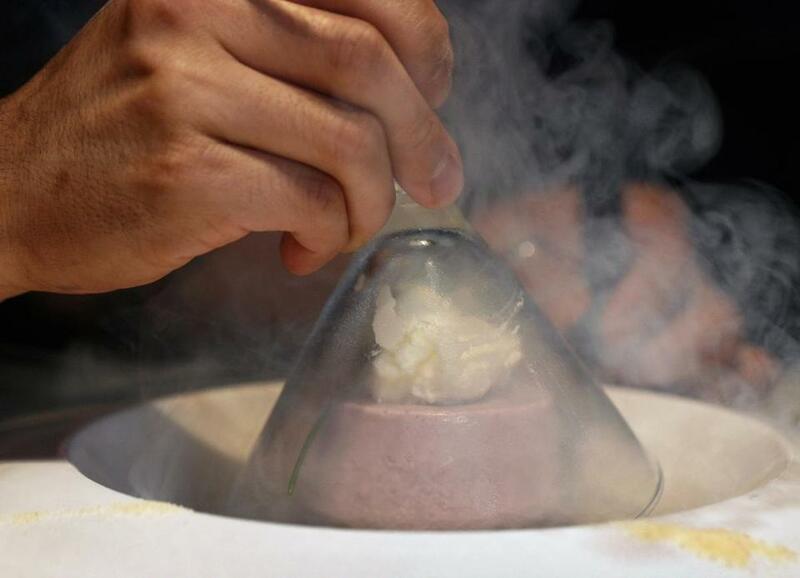 At Bokx 109 American Prime, chef Stephen Coe serves a smoked honey-lavender cheesecake with a whipped almond cream topping, which is engulfed in smoke. NEWTON — Every chef likes a place to test new ideas, techniques, or ingredients. For Stephen Coe, that place is Hollow Tree Farm in Plymouth, where he lives with his wife and three children under 5, and is surrounded by cranberry bogs, raised-bed gardens, a greenhouse, and beehives. 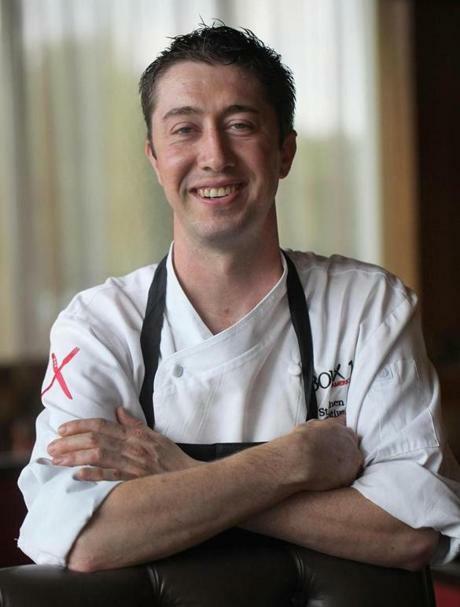 Coe, executive chef of Bokx 109 American Prime at Hotel Indigo in Newton, might wander the 22 acres of his land and wrangle bees, plant mushroom spores in a wooded area, or harvest a rogue crop of saffron. The results of his rural experiments sometimes make their way onto his menu. Currently he’s adding honey, honeycomb, nectar, and pollen to sweet and savory dishes, drinks, and cocktails. Chef Stephen Coe of BOKX 109 American Prime in Newton. This mind-set has fueled Coe’s rise in the industry over the last 20 years, leading to his second stint at Bokx (he was a sous chef at the 2008 opening, then left to open his farm, cook in South Shore restaurants, and work as a consultant for Food Truck Nation; he returned last August to run the kitchen and design the menus). The sleek wood-paneled dining room with soft lighting quickly makes you forget the traffic and trolleys of I-95 and the Riverside MBTA station within earshot. That’s where bee pollen comes in. The granules are made of pollen collected from the legs of honey bees as they travel from flower to flower. Bee pollen is considered to be high in protein and is used by the bees to nourish their babies. Coe uses it in a blueberry smoothie that has a deep blue color, which he serves in a tall curvy hurricane glass and tops with whipped almond milk, honey, and pollen powder. The chef makes the pollen powder with a mixture of honey, nectar, and bee pollen granules that he dehydrates and pulverizes. The resulting fine, sandy-colored powder, with a taste similar to maple sugar, can go into smoothies, vinaigrettes, and granola. Bee pollen and bee pollen granules are available at some supermarkets and health food stores (they can cause an allergic reaction in those with an allergy to bees). Two other honey- or pollen-related menu items are the cheese plate, served with a nugget of fresh smoked honeycomb, oozing with golden elixir from Hollow Tree Farm, and a smoked honey-lavender cheesecake employs a molecular gastronomy technique to create a sensory experience that is backyard bonfire meets high-end cuisine. Coe and one of the kitchen crew, dressed in black, use a blowtorch, a hand-held “smoking gun,” and an inverted martini glass to engulf the purple and white cake with smoke. It makes the whipped almond cream topping taste like a roasted marshmallow. After it clears, several flavors emerge: the delicate taste of lavender in the surprisingly light and satisfying cheesecake, a light crackle and floral taste of bee pollen in the graham cracker crust, and the rich sweetness of a blueberry compote base. If you order the cheesecake to go, don’t be surprised to find smoke billowing out of your box.